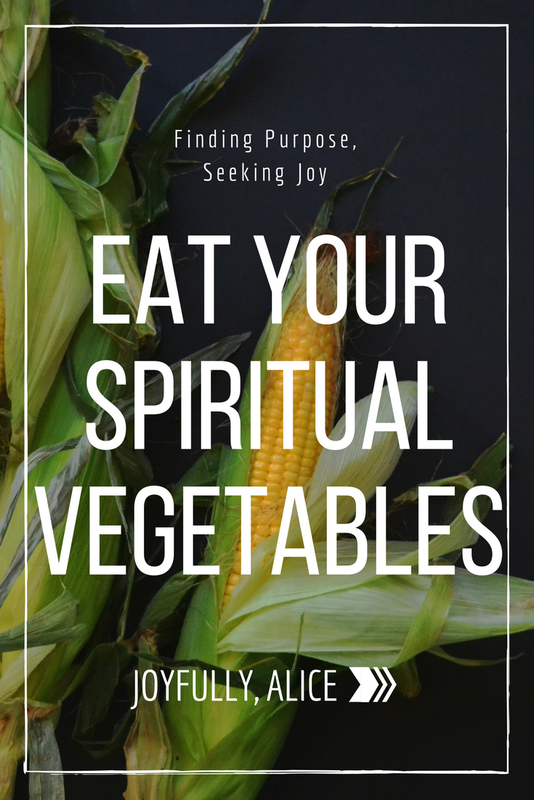 Last week in my post I talked a bit about needing to read the entire Bible, or "eat your spiritual vegetables." Some people found it a humorous statement, but it's true. We can't only read the parts of the Bible that make us feel warm and fuzzy, and expect to grow. Because by definition, stretching requires us to go past where we feel comfortable. Eating our vegetables isn't always exciting, but we all know that we need to do it regardless. We might like some vegetables better than others, even some of the ones that most people don't enjoy, but there's always a couple that just don't seem appetizing. The Bible is like that too, with books that bore us to tears or make us so uncomfortable that we will do just about anything to keep from reading them. The last time I started a 'Bible in a Year' reading plan, I got to the beginning of Leviticus, and felt myself groan. I don't think anyone would ever list it as their favorite book of the Bible (but if you do, I'd love to hear about that! ), and every run through it before felt more like an exercise in endurance than enjoyment. For me, it definitely falls into the "spiritual vegetables" category, where I find myself reading it only because I know that it's good for me. Little did I know that God had some big things He wanted to tell me as I studied it. If you haven't read Leviticus before, it's essentially documenting all the laws of the Israelite people which were given to them by God. There are some massively complicated rituals commanded of them, and most of them make absolutely no sense in our modern context. So reading through it with 21st-century eyes can be a chore, to say the least. But God included it in the Bible for a reason, so I push through anyway. Much of the early chapters in Leviticus talk about the procedure for presenting various offerings in the tabernacle. There are specific instructions given depending on whether the offering is a peace offering, sin offering, burnt offering, and so on. But as I read through these instructions, I was struck by something I'd never noticed before: God repeatedly commands that the remainder of the offerings should be kept for the priests. The Levite tribe of Israel was chosen by God to be the priests. They and their families were to serve, generation after generation, standing in the gap between the Israelite nation and the God who led them. This was a full-time role which did not leave time for them to support their families in any kind of traditional manner. They were essentially unable even to grow their own food. Because of their role, the priests had to fully rely on God's provision in order to survive. And here's the thing: God met their needs in a big way. The offerings presented to God were off-limits to the average Israelite. They simply brought their offering to the tabernacle, and the priest dealt with it from there. Much of it was good food: the best of the meat and grain cultivated within the Israelite nation. Bringing substandard offerings -- spoiled grain or blemished animals -- were unacceptable, as God asks the very best of His people. It meant that an offering had to come from a place of true sacrifice for the person bringing it. It was taking a very real part of their livelihood, something which may have been considered a luxury, and choosing to give it to God instead. But God is pretty neat in His reasoning here, which served a dual purpose. In asking the Israelites to make genuine sacrifices to serve Him, He was not only reaching out to them to build a real worshipful relationship, but He was also making provisions for the priests whom He had called into full-time ministry. The priests and their families were ensured a constant supply of quality food that was only theirs to enjoy. This allowed them to freely serve the people without having to worry where their next meal would come from. I think it is so beautiful that God doesn't call people into things and then leave them alone to fend for themselves. He sees the bigger picture and has the details worked out even as He asks us to do hard things. If we're willing to step out and act in obedience, He is faithful to keep us going. It won't always be easy or fun, but partnering with God is always worth it. So if I can encourage you with one thing today, let it be this: God won't call you where He isn't already. If He's asking you to trust Him, you can be sure that He isn't going to let you fall on your face. He won't abandon you to fight the entire war on your own, because that's not who God is. He is always, always, always there. Shortly after I read this passage, I found out that the job I had been counting on returning to for the summer was no longer an option. That job would have meant I would have had very little in the way of financial concerns, and it was great hands-on work experience in museums. The prospect of being unemployed with one year of university to go scared me a lot, and I was angry that my application had been dismissed with little explanation. As I scrambled to find another job with no luck, I remembered this message of provision, but didn't fully understand how relevant it would become for me in the months that followed. As I considered volunteering another season in camp ministry, God threw open a phenomenal series of doors within a matter of days, answering prayers I hadn't even known the words for. Because I went to camp, I was able to meet a family who invited me to move into their basement for my final year of school. I made friends who have became family. And I received enough financial support to scrape by this year without having to take on a part-time job. While it has been a challenging year that has stretched me in more ways than I thought possible, it has been one of the most beautiful blessings. Because God is good and when He asks us to do hard things, He will meet the needs that arise along the way. Just like He met the needs of the Levite priests. I never would have learned this if I hadn't been reading Leviticus. Obligation got me there, but God's goodness kept me going. Friends, we have to eat our spiritual vegetables; we have to read those parts of the Bible that don’t excite us. God's word is good -- all of it. He has powerful things to say to us, things that He desperately wants us to know. But if we let ourselves get stuck reading the old familiar, comfortable verses, we will miss out on so much. We don't have to go into it pretending that we're thrilled to be there, but we just need to say yes to God and trust that He knows better than we do. I'm not going to lie, I still don’t feel like reading books like Leviticus most of the time. But glimpses like this remind me why it is so important to buckle down and do it anyway. Let's commit this week to read something that we've been avoiding, and let God's truth sink into the areas we're reluctant to invite him into. It's worth it, I promise. Is there a particular passage you've been avoiding? Or have you recently read a passage that you found unexpectedly powerful? I'd love to hear about it in the comments below!